Served as either an entree or side, this traditional dish with an Italian twist makes a tasty addition to any brunch or breakfast menu. Mince 1 garlic clove; split second clove in half and reserve. Heat 1 tbsp. oil in skillet. Add garlic; sauté 2 min. Stir in tomatoes, salt, and pepper; cook 30 sec. Remove from heat; add red onion, parsley, and vinegar. Lightly toast bread slices. Rub one side with halved garlic clove; brush with oil. Fill deep skillet with 3 in. tomato juice; bring to a boil. Reduce heat to keep juice gently simmering. Slip eggs, one by one, into juice; cook until set, 3-5 min. Remove eggs; drain. 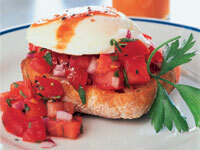 For service, spoon tomato mixture onto oiled side of each toast; top with a poached egg.